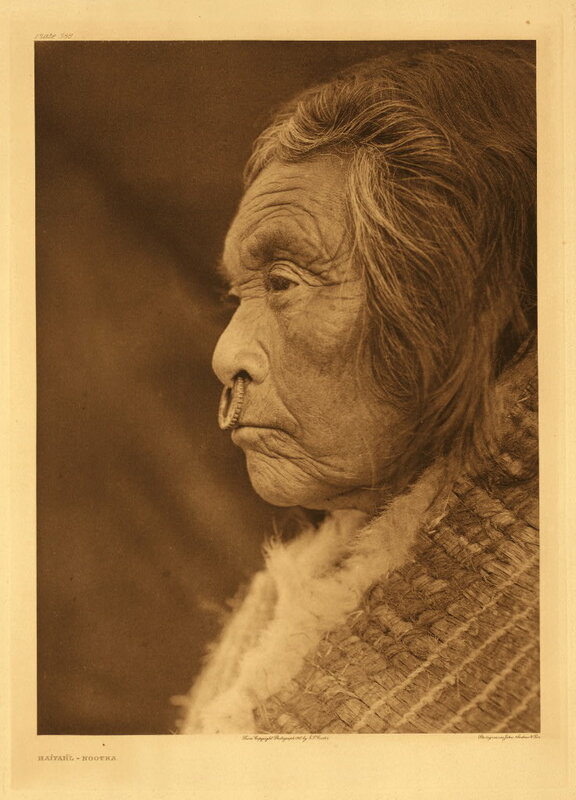 Arima, E.y.. "Nuu-chah-nulth (Nootka)". The Canadian Encyclopedia, 16 October 2018, Historica Canada. 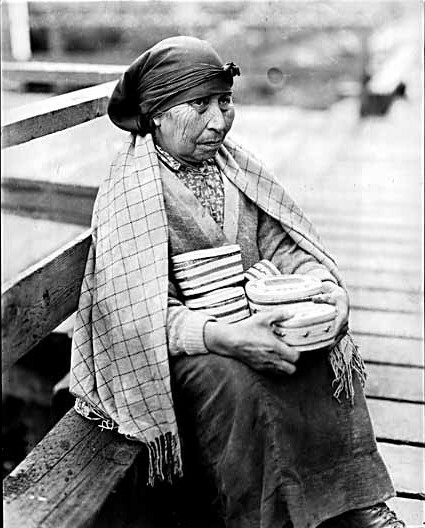 https://www.thecanadianencyclopedia.ca/en/article/nootka-nuu-chah-nulth. Accessed 20 April 2019. John Webber, 1778, pencil drawing. When Captain James Cook first met some Nuu-chah-nulth peoples in 1778, he mistakenly assumed that they were all part of the same tribe. Although the Nuu-chah-nulth shared traditions, languages and aspects of culture, they were divided into chiefly families or nations. Each nation included several local groups, led by a ha’wiih (hereditary chief). Each group also lived off the resources provided within their ha’houlthee (chiefly territories). Today, the ha’houlthee of the Nuu-chah-nulth First Nations stretches approximately 300 km of Vancouver Island’s Pacific Coast, from Brooks Peninsula in the north to Point-no-Point in the south, and includes inland regions. There are also currently 14 Nuu-chah-nulth First Nations divided into three regions: the Southern Region (Ditidaht, Huu-ay-aht, Hupacasath, Tse-shaht, Uchucklesaht); the Central Region (Ahousaht, Hesquiaht, Tla-o-qui-aht, Toquaht, Ucluelet); and the Northern Region (Ehattesaht, Kyuquot/Checleseht, Mowachat/Muchalaht and Nuchatlaht). Although the Nuu-chah-nulth did not surrender their land on Vancouver Island, the Canadian government created small reserves for them in that area in the late 19th century. Curtailment of hunting and fishing, including prohibition of the vital salmon weir traps, deprived the Nuu-chah-nulth of their traditionally rich economic base. 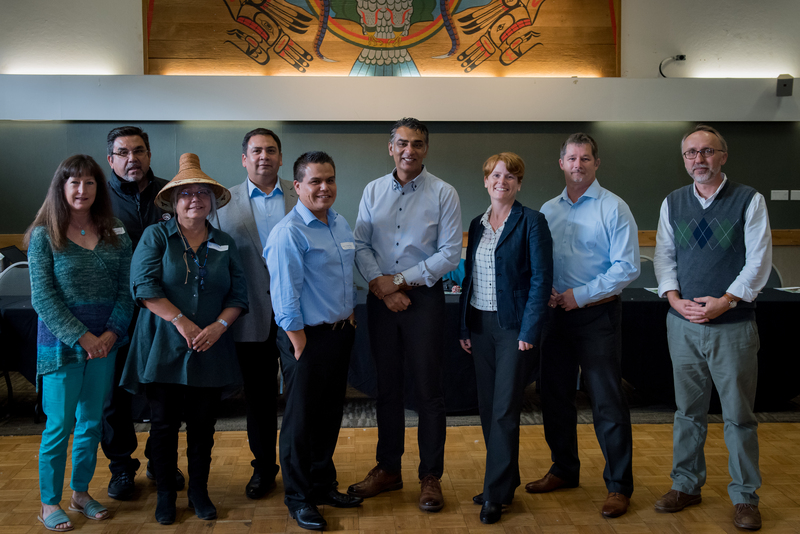 Over the years, various Nuu-chah-nulth nations have entered into negotiations with the British Columbia government and Canadian government	over land claims and rights to traditional territories. Up until 1830, more than 90 per cent of the Nuu-chah-nulth were killed by diseases introduced by Europeans (malaria and smallpox), and by cultural turmoil resulting from contact and trading with Westerners. Acquisition of guns intensified warfare, with well-armed Nuu-chah-nulth groups such as the Mowachaht, 'A:ho:sath and Tla'o:kwi'ath nearly exterminating others such as the Machl-'ath, 'O:ts'o:s'ath and T'ok'wa:'ath. 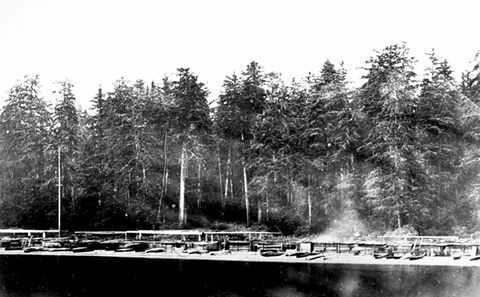 The Nuu-chah-nulth population, estimated at 30,000 at first contact, plunged to only about 2,000 in the 1930s. In 2014, there were 4,606 registered Nuu-chah-nulth, according to the Government of British Columbia. As of 2016, Statistics Canada reported 4,310 people identifying as having Nuu-chah-nulth ancestry. The Nuu-chah-nulth were hunter-gatherers, who made their living primarily from fishing. Fish (particularly salmon and halibut), sea mammals and shellfish were mainstays of their diet, supplemented by fowl, deer, elk, bear	and plant foods. Hunting parties travelled in large canoes during the winter and spring, to and from inlets and camps where they fished and hunted before returning home. At Nootka Sound, painting by John Webber, 1778. The Nuu-chah-nulth had a ranked society, divided into the nobility, the commoners and the slaves. Chiefs, who were part of the nobility class, presided over their respective communities, and were responsible for making important political and economic decisions for their people. A similar hierarchical structure was found in families, where heads of household were responsible for the protection and well-being of their family members. 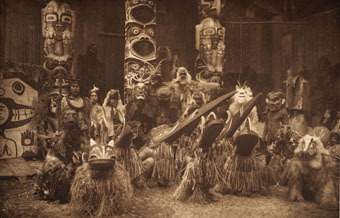 Relations with other Pacific Northwest Coast Indigenous Peoples were generally friendly, especially with the culturally- and linguistically-related Kwakwaka'wakw on the northwest of Vancouver Island. Relations with the less culturally familiar Coast Salish groups to the east and south of the Nuu-chah-nulth territories were not as amicable. However, trade and intermarriage occurred between these differing nations. 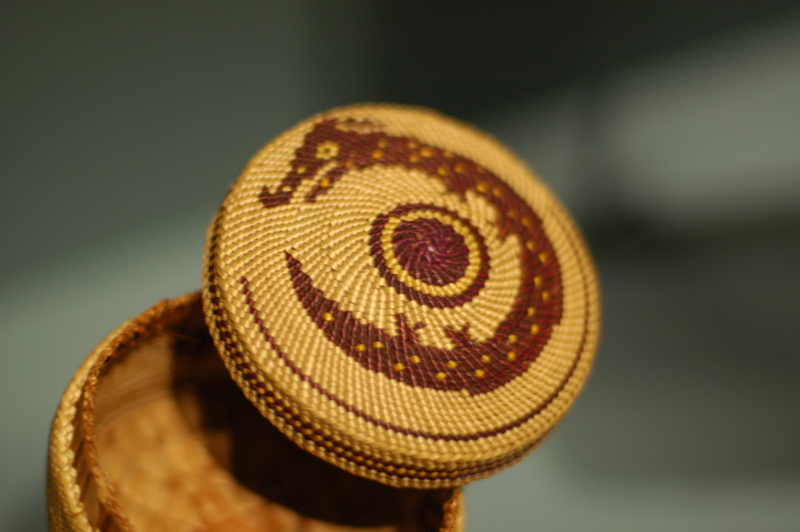 Historically, the Nuu-chah-nulth have had a strong ceremonial culture, characterised by feasting and entertainment with song, dance, contests and theatricals (see Potlatch). The Wolf Ritual, which took place in the winter, was a particularly elaborate celebration of a general secret society that aimed to teach people about heroism, life and death, and the teachings of the elders. Another important winter ceremony was the Doctoring Ritual. Primarily held by central and southern Nuu-chah-nulth peoples, the ritual aimed to help cure a sick person with the singing of special songs. 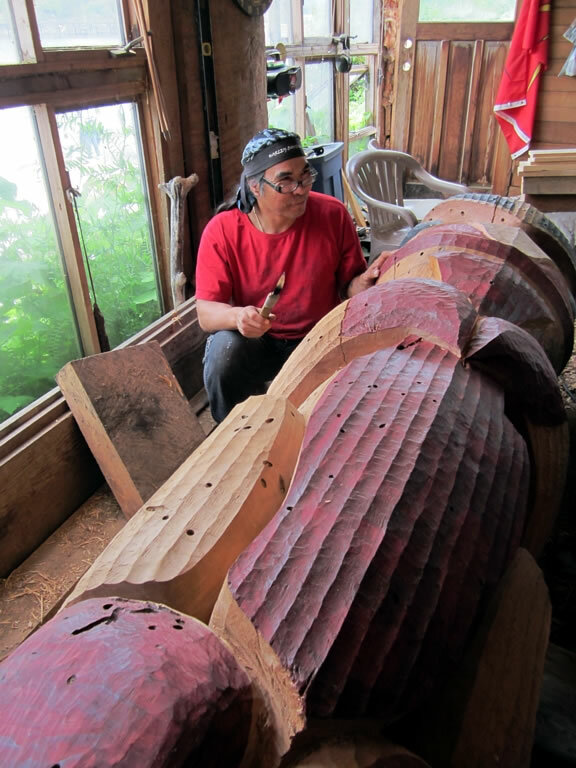 The Nuu-chah-nulth have also been known for their stunning woodwork, including canoes, totem poles, multifamily houses and other products hand-crafted out of fine cedar (see Northwest Coast Indigenous Art). 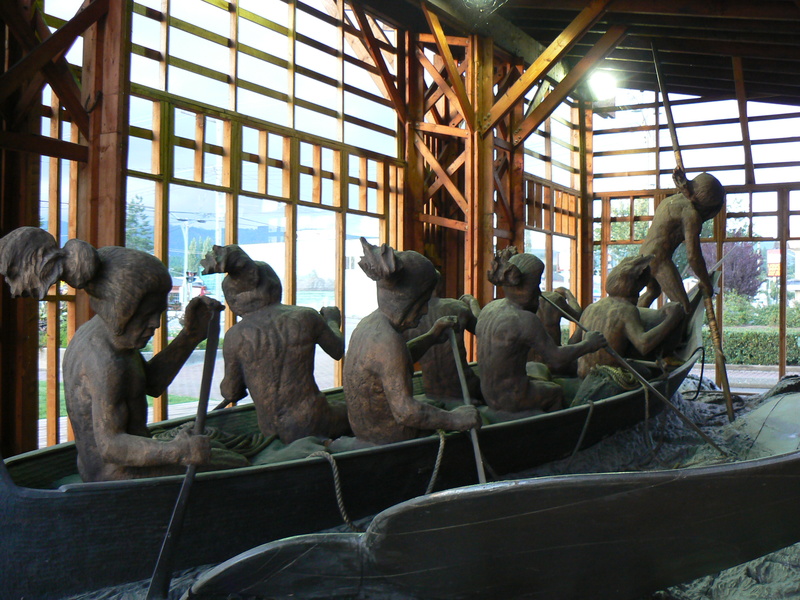 Life-size Nuu-chah-nulth whaling canoe sculpture in Port Alberni, British Columbia (2008). The piece was once in the Royal British Columbia Museum in Victoria. 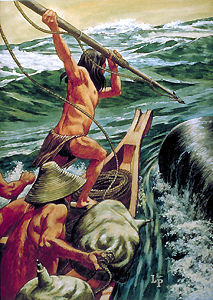 Nuu-chah-nulth (Nootka) whalers paddled to open sea in eight-man cedar dugouts to harpoon gray whales, desired for their oil and meat. Whaling is an important aspect of Nuu-chah-nulth history. In addition to its economic value, whaling was essential to Nuu-chah-nulth culture and spirituality. It was reflected in legends, family names, songs and place names. 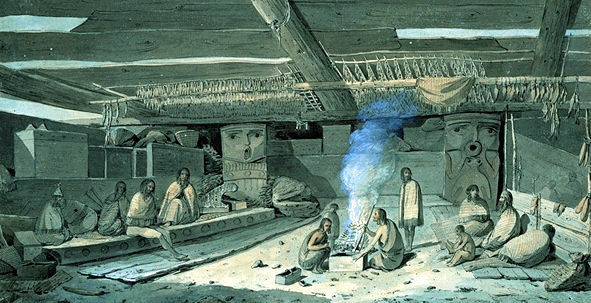 The Yuquot Whalers’ Shrine was a ritual house-like structure used in the spiritual preparations for whale hunts. After a controversial and disputed “purchase” of the shrine, the American Museum of Natural History in New York gained its possession and contents in the early 1900s (see George Hunt). 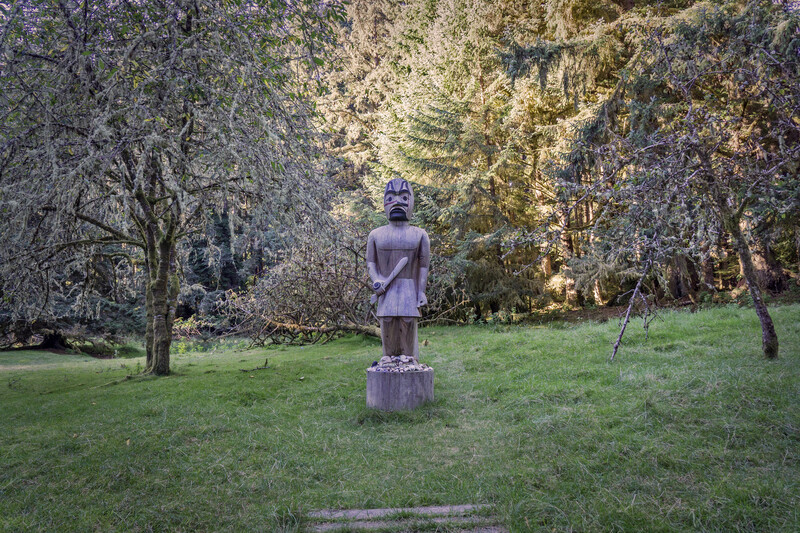 The original owners of the shrine, the Mowachaht	people, continue to petition for its return. The shrine, and the Mowachaht’s efforts to reclaim the shrine, was the subject of the film The Washing of Tears (Hugh Brody, 1994). Linguistically, Nuu-chah-nulth (Nuučaan̓uɫ) is one of the two main divisions of the Wakashan family, the other being Kwak'wala. There are at least three recognizable dialects of the Nuučaan̓uɫ language: Northern Nuu-chah-nulth (spoken on the west coast of Vancouver Island, from Brooks Peninsula to Kyuquot Sound); Central Nuu-chah-nulth (spoken from Kyuquot Sound to Clayoquot Sound on the west coast of Vancouver Island); and Barkley (spoken in the areas in and around Barkley Sound on the west coast of Vancouver Island). Though some linguists recognize Makah and Nitinat as other Nuu-chah-nulth dialects, there is no consensus among Wakashan specialists about their appropriate linguistic categorization. Nuu-chah-nulth is considered an endangered language. As of 2016, only 380 persons identified the language as their mother tongue. Note that this figure does not distinguish fluent speakers from learning speakers; therefore, there might be fewer people who can speak the language very well. (See also Northwest Coast Language Families; Indigenous Languages in Canada). The Nuu-chah-nulth belief system centres on a Creator being as well as spirits whose powers can be used to bring peace and fortune. The Nuu-chah-nulth believe that all life forms have a spirit, and should therefore be respected and appreciated. Shamans	ensured the spiritual health of the people by practising ancient medicines and healing rituals to cure illness and restore balance to the soul. Nuu-chah-nulth stories and legends speak of their past and also seek to impart traditional knowledge to future generations about life and culture. Most creation stories speak of the Creator who made the lands, waters, creatures and people. Nuu-chah-nulth stories also tend to feature important cultural figures, such as Raven and Mink, both of whom help the people to adapt to their surroundings. (See also Raven Symbolism). Nuu-chah-nulth stories about the origin of the world differ according to the nation. One version of the story tells of a time before there was sunlight — a dark era during which light was kept securely in a box guarded by a great chief (sometimes referred to as the Old Fisherman). Raven wanted this light and attempted different methods of trying to release it. One day, he transformed himself into a leaf and ended up in the teacup of the great chief’s daughter. She accidently ate the leaf, and, in due time, gave birth to Son of Raven. The re-born Raven asked his now grandfather — the great chief — to see the box of light. He eventually agreed and opened the box, releasing light. Son of Raven transformed himself once again, this time back to his original form. He flew high into the sky, carrying the light with him. Son of Raven placed the light in the sky, creating the sun that shines down on us all. Spanish explorer Juan Jose Peréz Hernandez first encountered the Nuu-chah-nulth in 1774 while navigating the Nootka Sound. On 9 August 1774, his crew traded with the Nuu-chah-nulth, offering them Californian abalone shells. However, the Spanish did not stay in Nootka Sound for long, and did not lay claim to the area. In 1778, British explorer Captain James Cook anchored near the village of Yuquot on Nootka Island. Relations between Cook’s crew and the people of Yuquot were cordial, though sometimes strained. In trading, the people of Yuquot demanded metal objects from the British in exchange for valuable sea otter pelts. 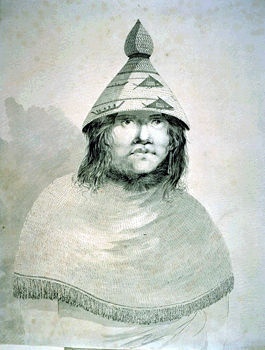 From 1789–94, the Nuu-chah-nulth became involved in the Nootka Sound Controversy, a bitter dispute between the Spanish and British over control of Nootka Sound. Chief Maquinna of the Mowachaht Nuu-chah-nulth took advantage of the popularity of Nootka Sound to both manipulate and regulate competition between the disputing nations. Competition between Spain and the Great Britain for Nootka Sound was settled with the Nootka Conventions of the 1790s, during which Spain agreed to abandon its claims to the North Pacific coast. Not all trading experiences with Europeans and North Americans were amicable, however. In March 1803, Maquinna and his men captured the American trading ship Boston, and killed the captain and most of the crew, sparing only two, whom they kept as slaves. In another instance, in 1811, the Tla-o-qui-aht attacked and destroyed the trading ship Tonquin in Clayoquot Sound as an act of revenge for an insult by the ship’s captain. By the 1900s, the increased presence of European settlers on Nuu-chah-nulth lands forced them onto government-created reserves. Assimilationist federal policies — including the Indian Act and residential schools — eroded Nuu-chah-nulth culture and traditional ways of life. Nuu-chah-nulth peoples continue to work towards revitalizing and preserving their language, culture and spirituality. Founded in 1958, the Nuu-chah-nulth Tribal Council (formerly the West Coast District Society of Indian Chiefs) provides various services to approximately 9,500 registered members, including child welfare, education, employment training and other socio-economic programs that support health and development. The Nuu-chah-nulth have been actively involved in the protection and promotion of their rights to hunt and fish on traditional territories. On 2 July 2013, the British Columbia Court of Appeal ruled in favour of Nuu-chah-nulth commercial fishing rights, which had been an area of dispute between the province and the Nuu-chah-nulth. However, more negotiations are expected with the federal government, and particularly the Department of Fisheries and Oceans. The Nuu-chah-nulth are also seeking self-government. In 2011, some Nuu-chah-nulth bands — known as the Maa-nulth First Nations — became self-governing. They negotiated the second modern treaty with the Government of British Columbia, which provided the Maa-nulth with $73 million over 10 years and a land settlement of 24,550 hectares, in addition to other annual funding and payments. E.Y. Arima, The West Coast Nootka People (1983). Alan L. Hoover, ed., Nuu-Chah-Nulth Voices: Histories, Objects & Journeys (Royal British Columbia Museum, 2002). Alan D. McMillian, Since the Time of the Transformers: The Ancient Heritage of Nuu-Chah-Nulth, Ditidaht, and Makah (UBC Press, 1999). Edward Sapir & Morris Swadesh, Nootka Texts: Tales and Ethnological Narratives with Grammatical Notes and Lexical Materials (Linguistic Society Of America, 1939). Conseil tribal Nuu-chah-nulthRenseignez-vous sur la culture, l’histoire et la langue des Nuu-chah-nulth, et plus encore.